My sister has introduced me to a great many ingenious things and one of these amazing referrals is the ever-growing collection of Penguin clothbound illustrated classics. As she is the Director of Global Operations at a not-for-profit organization, she is continuously travelling to foreign lands. Whether she is in Asia, Europe, or South America this or that week, she goes to the local bookshop to see if she can find one of the clothbound classics that she doesn’t have yet. She will then bring it back to add to the bookshelf. Her bookshelf certainly has a backstory if I’ve ever seen one. I have been collecting these editions as well for the past several years. My collection grows at a snail’s pace because I have to read each and every one of them. That is my goal. Some I have read in the past, but I like to flip through them with a new pair of eyes, to live through the pages once again before endeavoring to a new illustrated classic. Penguin produces new additions every year and it is lovely to see the new editions on the shelves. 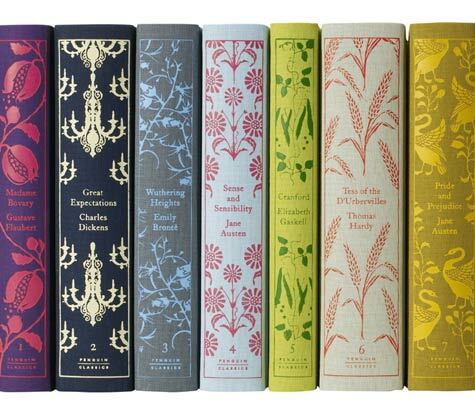 Additionally, Penguin produces children’s clothbound classics as well which are equally delightful.